This small town on the East coast of Iceland has quickly become one of our favourite destinations so far on our trip. Since Eb and I started travelling, we like to take note of the places we find liveable and if we could see ourselves living there. So far those places have been Leiden Netherlands, Lyon France, Provence France and new to the list is Neskaupstaður, Iceland (more so for me than Eb). Neskaupstaður is a little different to those other places mentioned though. Our time living here was mentally challenging due to living there in the coldest and darkest months of the year. Daylight would appear around 10:30-11am and the darkness would start from 3-3:30pm. I hated it. I would struggle with the darkness and slipping on ice when going outside, but strangely, at the same time I really liked it! I think I liked the thought that I wasn’t used to this. It certainly made me respect these locals who live with this daily. I was speaking to one of my Icelandic mates, Tristan, and I asked him how he copes with it and he said it’s just normal to them. He did say there’s a big difference between summer and winter though, that everyone walks around with a spring in their step in summer compared to winter. In summer they have to deal with the midnight sun though! He told me that they have 8 months of snow and ice, or at least that’s when the snow is starting to melt. I couldn’t get my head around that. Everyday life is hard to do. I struggled walking outside every single day, it was either super slippery or it was fresh snow. Parents, instead of walking their children, they’re pulling them with the kids sitting on a sled. Imagine driving everyday on slippery surfaces. With the little bit of driving I did, I quite liked it, I know for most Australians that would be a nightmare. Most locals walking the streets had spikes on the bottom of their shoes and because it was so cold they were all layered up. So everyday life was a little bit difficult compared to the life I’m used to in Australia and yet, I liked it! 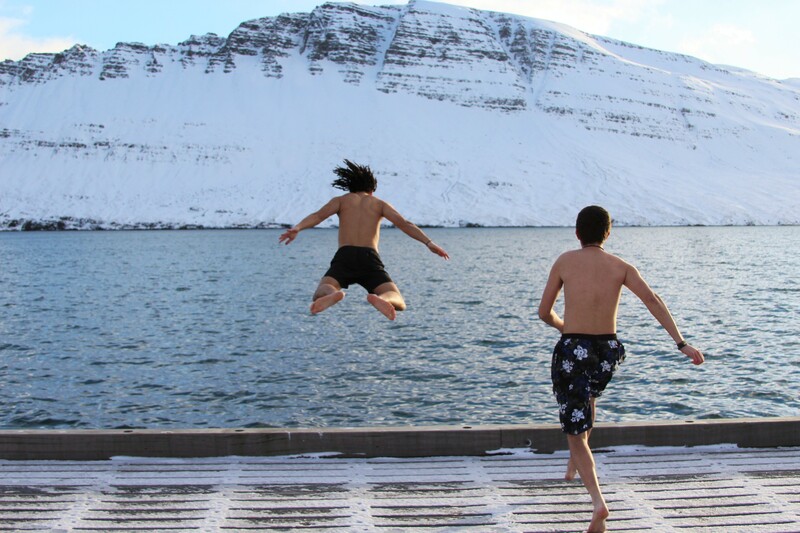 Ever since we arrived in Iceland I always wanted to do a polar plunge. Chris Burkard, a landscape/adventure photographer (who I love following), does polar plunges every time he’s in Iceland. I’d look outside the window everyday thinking about doing it. That was the biggest problem, thinking about it. It wasn’t until the last week when I’d mustered up the courage along with my German mate Phillip. The temperature this day was -7 degrees Celsius. It can be dangerous, as it can shock the body and the mind and you can struggle to swim or something like that. Some of the locals thought we were crazy and were opposed to our decision but I asked Gurri, who is like the wise man of the town, and he pretty much said – go nuts. That was good enough for me. So we stood on the wharf while a couple others climbed down the ladder to get their bodies wet but not their heads. Phillip and I planned to jump together, but as soon as I dropped my clothes I just ran and didn’t even think about it. It was a piece of cake. It did shock the body but we weren’t in the water very long. When we got out, I decided to do it again just for good times. When we got out we ran back to our apartment where we had the heaters pumping. I did get a few strange looks as I was running back with just my board shorts on and no shirt. Eb was too chicken to give it a ago. One night, Gurri (the wise man of the town) treated us to a late night of 4×4 off road drive to his family’s summer house. You literally couldn’t get there unless you had a big monster truck like the one he had. It was such a bumpy ride. We crossed little rivers that were exposed in pot holes in the ice road. The summer house is located in the best position with these massive mountains surrounding it. It was the only house there! Perfect location for the northern lights as it was very dark there away from the town lights. We sat around the table and had beers and chocolates as Gurri shared stories of the past. Phillip and I decided to go for a walk up the mountain and wait for the northern lights. The activity was very low that night but we did see them. It was quite fun being near the top in complete darkness. On one of our last days, the hotel chefs Hronn and Gudni treated us to a little road trip and some lunch, which was so nice of them. They rarely leave Neskaupstadur so it was nice to escape with them. They took us to the biggest “forest” of Iceland. It’s not much of a forest but it’s where most of the trees in Iceland are located. Gudni said there’s a saying that if you get lost in the Icelandic forest, all you need to do is stand up. They told us that during summer it’s absolutely packed by Icelanders usually from Reykjavik. We walked down to the lake and it was really crazy to see the lake frozen over. We threw some rocks across the lake and they would just slide across the lake! Our next stop was Seydisfjordur for some pizza and a beer. Seydisfjordur is the same town that we arrived in by ferry. This town is amazing! You have to go over this mountain pass to get there. Sometimes when the weather is really bad, the mountain pass closes. Once you get over the mountain pass you can see Seydisfjordur which is at the very bottom. If you’ve seen the movie “The Secret Life of Walter Mitty” and remember the downhill skateboarding scene, this is where they shot that scene. I really want to come back here and ride my bike or skate down here in the summer. Seydisfjordur has this really eerie vibe to it. It’s quiet and it’s very dark and Hronn and Gudni told us that back in the day it was common that people would commit suicide here. The town is at the bottom of a fjord and has these big mountains which prevent the sun from getting through. The sun doesn’t come here for 8 months! No wonder people used to get depressed. It is a very pretty town though and has this awesome pizza joint for some really good pizza and good vibes. It was basically a hipster bar that served pizza. You have to visit it if you go to Seydisfjordur. That black bit near the back is Neskaupstadur! What a fantastic blog! We ask ourselves the same when we visit places “could we live here”. The hours of daylight there is mental. If sounds like it has positives and negatives. You guys are insane for doing the Polar Plunge! No way would I do that. Jason and I are considering doing a stop off in Iceland on our way to Denver. Reading this certainly makes me want to even more! Back to Asia now for you guys? Thanks for commenting! You guys have to visit Iceland, especially the east fjords. Do workaway with these guys if you go there. It is awesome there! Yes we will head back to Asia soon. No plans yet as to where will go. We’re back in England for 4 weeks. I haven’t checked out your blog yet but I know Eb has. I’ll have to have a look now so I can see what you guys are up to! I loved the story of the journey your blog is very good. This hotel that you guys found was which site? They usually recebr people by workaway? My wife and I have long wanted to start traveling, but we care a bit if we get to bear the despesas.voces in dao any idea? Hi Jeison, sorry for the late reply! We found this hotel through Workaday! I don’t quite understand your second question? but the question was if you guys are digital travelers to have a fixed source of income? we are thinking of going to Iceland were delighted my wife and I with photos and reports.